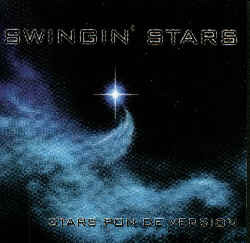 STARS PON DE VERSION is an enjoyable CD from the most durable band from Dominica, the SWINGIN' STARS. Once again,dance party lovers should add this CD to their collection. "So back off your shirt and move de morris chair". Hot soca tracks include "Chook","Granny Boogaloo" and "Pon de Version" with an exuberant vocalization by Calypsonian Daddy Chess. A lover's medley of oldies like "Knock 3 times"and Philip Horsford's versatility of the zouk,"TiCoco" will keep you going. Brassmen Norman,Buck and Bing add a spicy latin touch to Perez Prado's "Mambo #5". To choose this item, select the appropriate options (if any) and click "Add to Cart" to include it in your Secure Order.